Cosmochoria is currently in Early Access on Steam as an alpha build. It was a wildly successful Kickstarter, earning $28,696 out of the asked for $10,000. It’s developed completely by Nate Schmold and published by 30/30. It looks ridiculously cute, so let’s check it out! I think the Asteroids comparison is the most easily drawn here – a lot of your time is spent on a fixed axis shooting lasers at aliens. The first few times I played, I didn’t find any story elements except for a mysterious Magic 8 Ball on the first planet, which tells you different cryptic messages. I got “find the bearded one” a lot. In a later game, I found a snake with a cowboy hat and was absolutely delighted. He wanted me to get something for him. I imagine there will be a lot more elements like this scattered throughout every galaxy. The plot isn’t the main focus of the game, however. Or, at least, not at this stage. The graphics are an absolute delight. They remind me of paper cutouts, and everything is colorful and eye-catching. The detail on the smaller things like plants is really astounding, and all of the different alien species have a distinct look about them. There are so many different plants! I’m not sure if there will be more alien types later, but what is there is cool. I haven’t met any bosses (as you can see in the above screenshot) yet, but from the few screenshots I’ve seen, it looks like there are a lot of different ones of those too. The sound design is good too, with scary alien noises and great laser pew-pews. The ambient soundtrack is infrequent but beautiful, and I’d like to hear more of it throughout the game. The galaxy is procedurally generated, so every time you play, you’ll see something different. 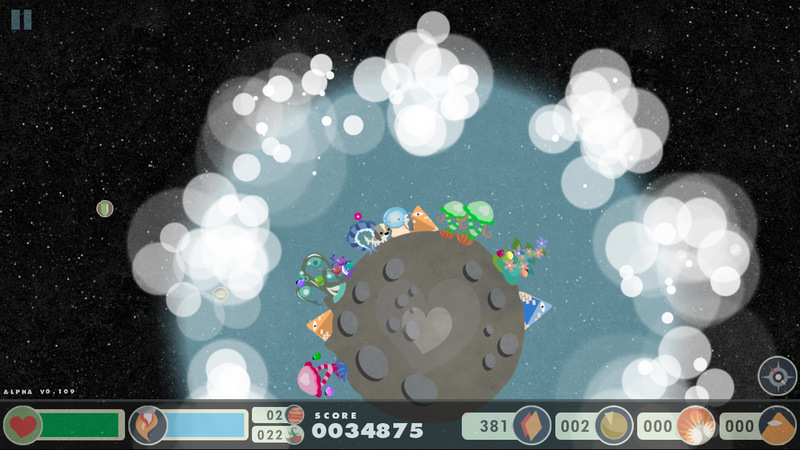 You begin the game on a small planet, and are instructed how to plant your one seed. That seed grows into a plant after a little bit, which will have at least three more seeds. After planting, you’ll see a heart and a shadow heart in the middle of the planet that you have to fill up. Depending on the size of the planet, this could be as few as four plants or can get into the dozens range. All the while, you’re fighting off aliens who are flying around trying to kill you. 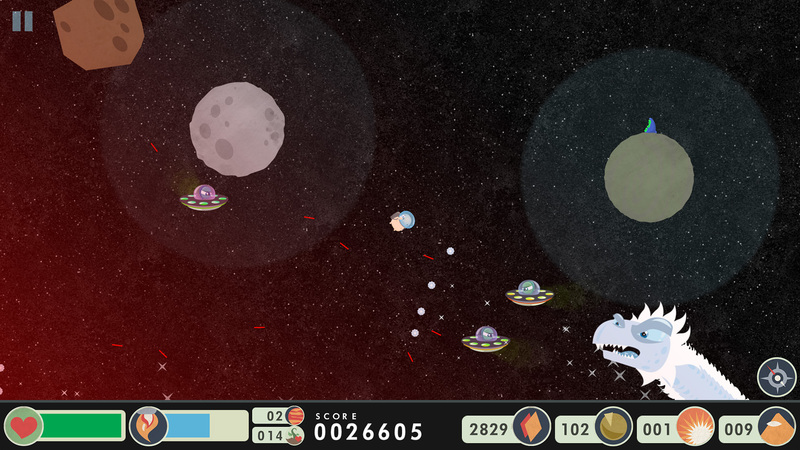 Killing off the aliens gives you gems, which allow you to buy upgrades. These range from better guns to more fuel for your jetpack. 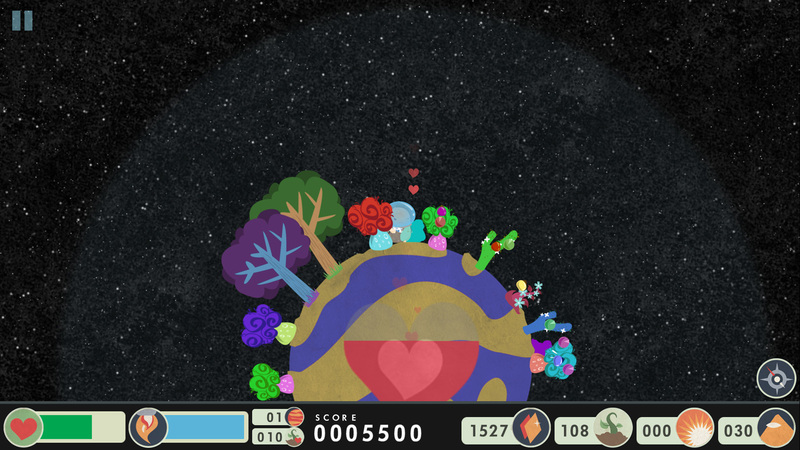 After you completely fill a planet’s heart meter, it transforms from a grey dead world to a beautiful, colorful one. It also heals you of damage you’ve taken. Then it’s off to the next planet to repeat the process! Sometimes you can find bricks, which allow you to make defensive towers and other things for the planet (like an Easter Island statue, for some reason). There are more things to build that I haven’t discovered yet, which makes me super curious. My one frustration with the game is how difficult it is to steer the jetpack. Far too often, I accidentally fling myself into the sun, or past a planet. I’m hoping with a combination of getting better at the game and buying jetpack upgrades, this won’t be a problem anymore, but it’s been disappointing to be having a really good run only to die accidentally because the jetpack doesn’t thrust in time. That being said, the “one more try” syndrome is readily present in this game, and it’s hard to not give it another go right after. Additionally, this being a roguelite, you can continue to improve your character with the upgrades, so when you die not everything is lost – I really appreciate that. There are 16 Steam achievements, which are all written in mysterious verse. Cosmochoria is well worth the purchase now. There’s a ton of things to unlock, and there’s definitely a one more turn effect in place. Sometimes I get a little frustrated, but it’s still in Early Access so I’m sure there will be adjustments. 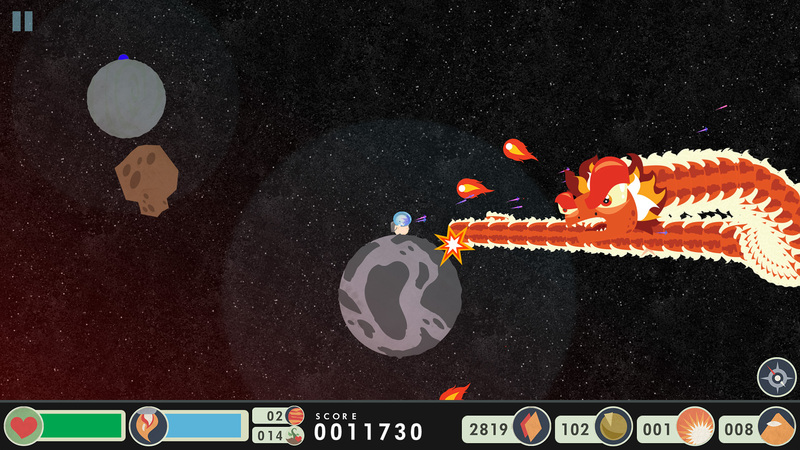 Get this if you enjoy space, a fairly relaxing game, and roguelites. Get Cosmochoria on Steam for $9.99. It’s currently in Early Access. Check out the official website here, follow the designer on Twitter, and follow the game on Twitter. Bonus! Here’s myself, Sarah, and Art playing Cosmochoria for StreamFriends. I’ll be sharing more of my StreamFriends videos on the site in the new year.